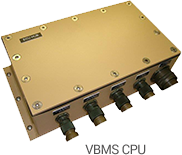 Merlin’s Vehicle Battery Management System (VBMS) is a comprehensive power management solution for military vehicles. The VBMS provides dead battery protection, intelligent split charging, and integrated battery monitoring in a package built to military specifications. 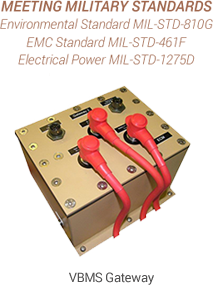 The VBMS’s dead battery protection eliminates dead batteries and over-discharging. Combined with split charging capabilities that prevent over-charging and under-charging, the result is longer battery life and improved battery performance. Integrated battery monitoring provides critical battery State of Charge (SoC) and State of Health (SoH) information. With accurate SoC warfighters are confident their batteries are charged, can eliminate unnecessary engine idling, and focus on their mission. Accurate SoH enables replacing batteries at their true end-of-life and eliminates early battery replacements. Reduced battery replacements and fuel consumption reduce logistical support costs. Ultimately, fewer convoys mean fewer lives placed in harm’s way. Download Specifications for our VBMS and VBMS Lite products. For stand-alone solutions, download Specifications for our PowerGuard (dead battery protection) and SmartBank (split charging) and BMS (battery monitoring system) products. Call to speak to one of our specialists today!